The last few days I’ve been doing a slow dig into my research. I am looking at the concerns teachers have about shifting to more student-centred pedagogy. I am also trying to find out what can be done to alleviate these concerns, particularly in the form of professional development. 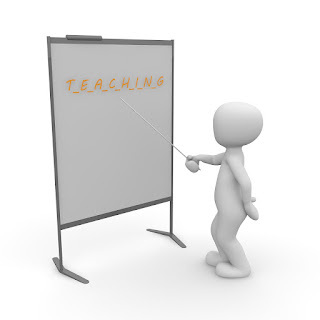 For non-teachers, very roughly, pedagogy is the art and science of teaching, the methods used in the teaching and learning process. Student-centred learning is when students have more of an active role in their learning. Instead of merely being recipients of information and drilled into skills, they undertake activities that develop skills in critical thinking, problem solving and much more. By having greater choice over the process of learning, students often take on more ownership of it. A traditional view, reinforced by popular culture, is that learning at high school consists of students sitting in rows, in a classroom, with a teacher talking at them, leading a discussion or showing some boring film. Sometimes learning needs to be with a teacher directing a class from the front but often it is not the best way to learn. It is probably the best way to maintain order and control in a classroom. Complete order and control is not necessary for learning to occur. Structure and purpose is important most of the time, but not so tight it confines students’ minds from thinking for themselves. Many teachers have difficulty letting go of order and control. In their minds, quiet work is productive work, and reflects well on them as teachers. It is so incongruent of a concept, it is hard for them to learn and implement strategies that allows students more freedom because the perceived risk is too high. One of the articles I’ve read about this is called ‘What if students revolt?’. This happens more in the higher grades because students have so much pressure on them to achieve in high-stakes tests, such as the HSC, they just want to be told what they need to write to do well in the exam, having very little focus on learning itself. I’ve had one frustrated student who pleaded, “Just tell me what I need to know”. Memorising and regurgitating information just doesn’t cut it anymore. The fear is also about students not achieving as well in assessments and that also reflecting badly upon the teacher. It is being scared of looking a fool by trying something out of their comfort zone and possibly failing. Textbooks give the false illusion that learning is linear and straight forward, a mere comprehension task. Textbooks also help teachers know exactly where they are up to in the teaching process and can check-in with other teachers about their pacing. It shouldn’t be about where students are up to in the textbook but where they are up to in their learning. This fear is exacerbated if teachers feel they don’t have the backing of the school leadership or the wider school community (eg school board, parents) and are constantly slammed in the media and by government figures. The literature calls this a lack of relational trust. From my own experience, this can occur in several ways. For instance, there is the fear that school leaders will change their mind and switch back from the new innovation to the traditional way or leapfrog onto something else again, thereby wasting a lot of time and effort of everyone involved. Sometimes when a teacher tries a new teaching method, as advocated by the leadership, and it results in complaints from students and/or parents, the leadership kowtow to the complainers when the teacher should be backed by them. It is demoralising and makes teachers even less inclined to change what they have always done. The risk to change becomes way too high. Some schools have gone through incredible changes, only to have a new principal come in and change it all back again. Most schools are going down the student-centred learning path but veer back to traditional teaching for the HSC when marks trump real learning. It’s the HSC game really. I hate how many times I say to my classes that in reality ‘xyz’ is this but for the HSC it is that. For example, in HSC Business Studies students have to write a business report. They are usually taught to write in exams an Executive Summary as a substitute for an Introduction and to keep it as brief as possible. It is purely to tick the box that they did one, and move on as quickly as possible to provide content that will produce the bulk of the marks. In reality, executive summaries actually are what they sound like they should be, a summary of the report and a rule of thumb is that it should be a page in length. I find this so frustrating! Exams are so removed from real life but are a convenient way of ranking people, distributing them across some statistically desired graph. We supposedly have a standards based system, meaning students are assessed against standards instead of against each other but when it comes down to it, results are manipulated to reflect a particular norm. A friend who has marked Food Technology exams has reported that when the statistics revealed the majority of students failed a question, the markers had to go back and scratch for just a word or two that could just possibly mean, perhaps, the student may have actually understood what they were writing about in some way. However, NAPLAN, the only compulsory external testing system in NSW before the HSC, is only about literacy and numeracy. Since NAPLAN and HSC results are so public, schools can fall into the trap of teaching to the test, resulting in formulaic responses that produce solid results. Teaching for genuine, deep learning, is much harder to test properly so that in our current system, real learning can result in wildly inconsistent outcomes in NAPLAN and the HSC. I always professed I wanted my children to be motivated more by learning than by assessment results. Yet I had to compromise that ideology when Emma wanted to learn Economics for the HSC but performed better in Ancient History, which she had been interested in for years but was now bored. To achieve the mark she needed for her desired university course, the interest in learning was traded in for a higher mark. Technology has a lot to do with the shift away from traditional learning, enabling students to participate in the learning process in new, innovative and fun ways. Just watch how young people jump to YouTube for tutorials in how to do something, from knitting (I have seen a student do that with my own eyes when they were supposed to be working on something else) to changing a tyre. The Internet is their go-to for communication, information, entertainment and well, everything, really. Many teachers find it hard to understand and adopt technology and are fearful of it. They are already forced online to mark their rolls, maintain a grading system, complete their welfare reporting and much more, so that to also have to learn more technology for the teaching process, it can be overwhelming. Technology can also be unreliable in schools, being such an expensive commodity. To me, the gap between the technology haves and have nots is the biggest divide in education of modern times. My son gained 17 marks on his school assessment in his Information Processing Technology HSC exam with a great deal of help from Eddie Woo’s YouTube videos. If we didn’t have a reliable internet at home this would not have been possible. I worry about students who don’t have access to reliable Internet at home - it will hold up their education and their adjustment to participating in life, at work and play. Schools need to help out more in this regard, but that’s a completely different post to write. I know and recognise I have been a bit on my soapbox in this post. I partly wrote it here to shake it out of my system so I can approach these issues in a more academic and studious way for my research. All these concerns are real and need to be acknowledged and addressed. I am looking forward to investigating how this can best be done.